At least three authors have written procedures for rebuilding the Simplex Valve Block, and each describes a different method for splitting the block open. I tried each method three times and encountered at least one consistent problem with each method. Therefore, I did some experimenting and came up with a method that I believe is superior to all three. 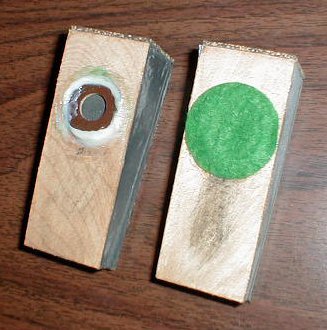 After studying the characteristics of hot hide glue, I discovered that extreme cold (zero degrees F. or colder) would crystallize the glue, weakening the bond to the adjoining piece. In addition, I knew from prior experience, that intense steam heat would loosen the cloth covering in about three minutes. Therefore, armed with those two facts, I developed the following procedure. Splitting the Simplex Block with virtually no damage to the wood, valve cap, valve (intake face) or valve seat. 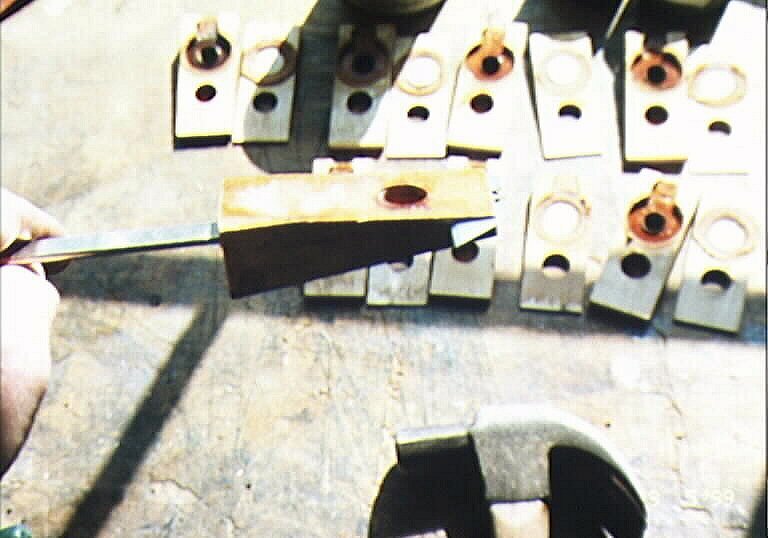 Preface: Scrape off most of the burnt shellac that holds the valve cap in place, but do not attempt to remove the cap at this time. Number each unit on the block and on the movable board with a ballpoint pen. It is best to indent the wood slightly since the steam will liquefy the ink and it could be easily rubbed off by accident. 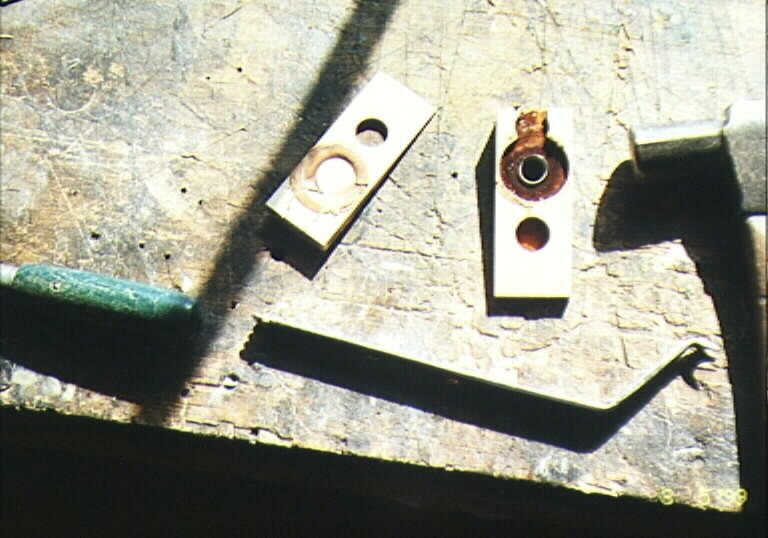 Before the blocks can be split open, the pneumatic cloth and gasket must be removed. The method I use for the task involves a lobster pot (or very large pot), a grate to elevate the blocks, a sharp knife, protective rubber gloves and steam. Do not remove the movable board. First timers should work with no more than 10 units (or less) at a time. It is far easier to work with smaller sets than 80-88 units all at once. 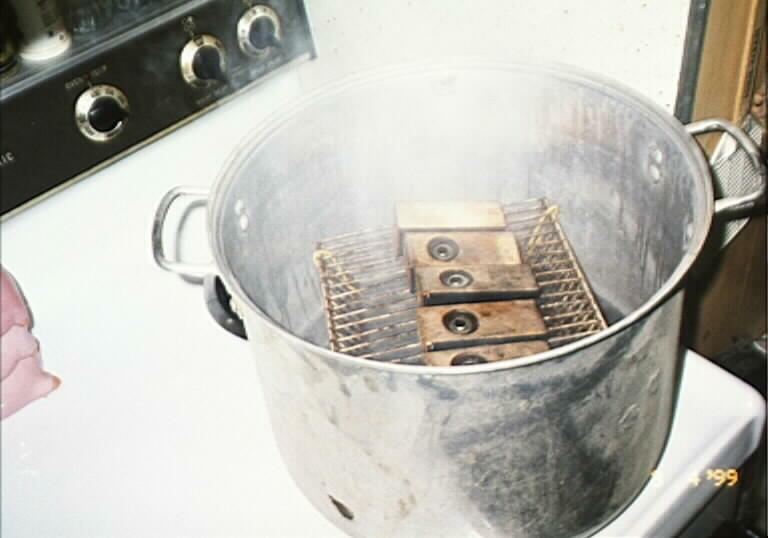 1) Fill the pot with about one-inch of water, cover, and bring to a rapid boil. 2) Place a block on the elevated grate and start timing minutes. (You should turn the heat down so the boiling water does not splash onto the block.) Keep adding blocks at *one minute intervals until five minutes have elapsed. 3) Put another block in the pot and remove one block. Locate the portion of the cloth that is overlapped (usually on the side, near the gasket) and peel off the cloth with the knife, all the way around. If the cloth resists being removed, put the block back in the pot and wait for another minute. 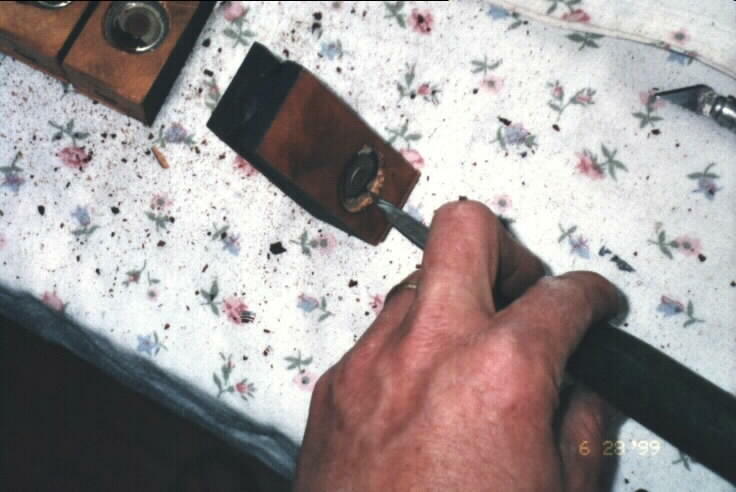 4) Before setting the block and movable board aside, take the knife and scrape off any remaining burnt shellac. Then slap the block (valve cap side down) onto a hard surface. The cap should almost fall out since the burnt shellac is mostly gone, and the steam heat has softened what is left under the cap. The cap can also be removed prying it out with the knife. However, it might get bent and that would render it useless. 5) Mark the block number on the 'inside' of the block with a felt marker. Then arrange the block, valve cap, valve and movable board in a box just as though they were all one piece and move on to the next unit. After about ten units are completed, take just the valve blocks and place them in a very cold freezer. To insure that the blocks get super-frozen, place slabs of dry ice around the blocks, but avoid allowing the dry ice to touch the blocks by placing paper between the two. Then wait at least 24 hours. 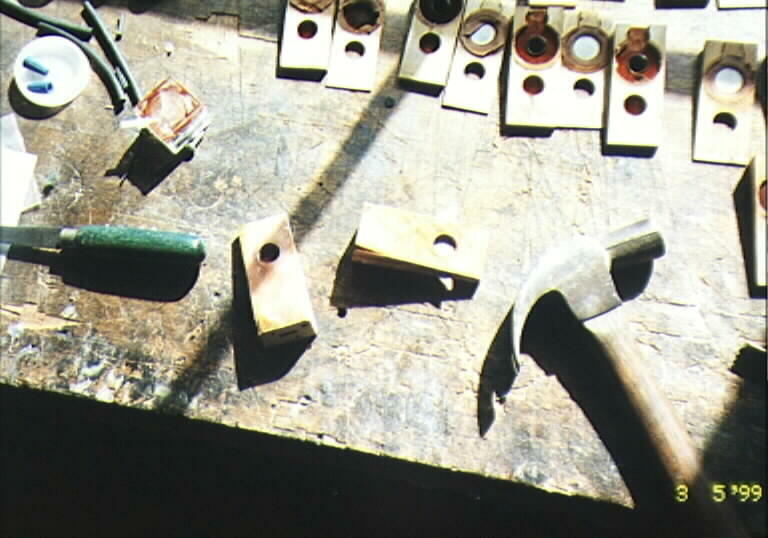 The final step in the disassembly process involves three tools: a small hammer, a specially sized piece of iron, and the blade from a utility knife or a very strong but very thin straight-edged knife. 1) Remove a block from the cooler and locate the joint on the very front leading edge of the block. You might have to wipe off the ice crystals to see the joint clearly. 3) Push the iron bar into the vacuum supply hole approximately 1/2", no more. (See photo) With the block oriented as it is in the photograph, place the block on the bench and steady it with one hand. 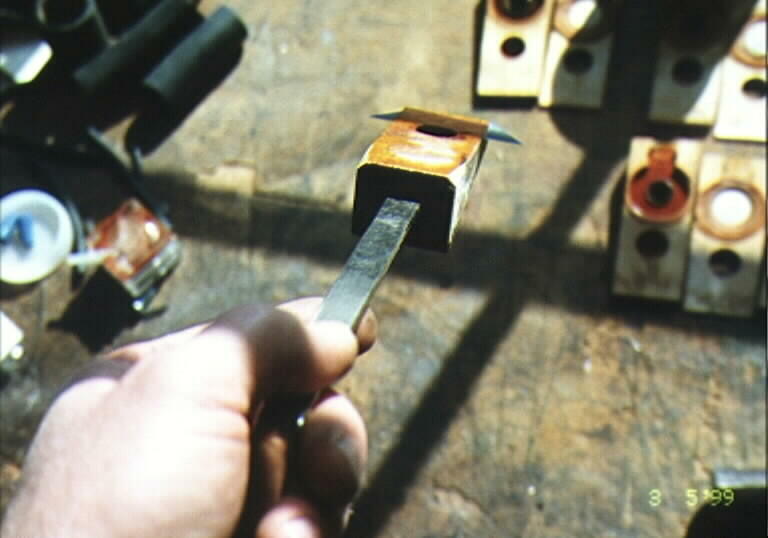 Grab the end of the iron piece (pry bar) and push down. (DO NOT lift up on the pry bar. Here's why. If you accidentally push the pry bar too far inside the supply hole, you could damage the edge of the pouch well or the bottom side of the valve seat.) As soon as the block cracks open the first time, STOP! 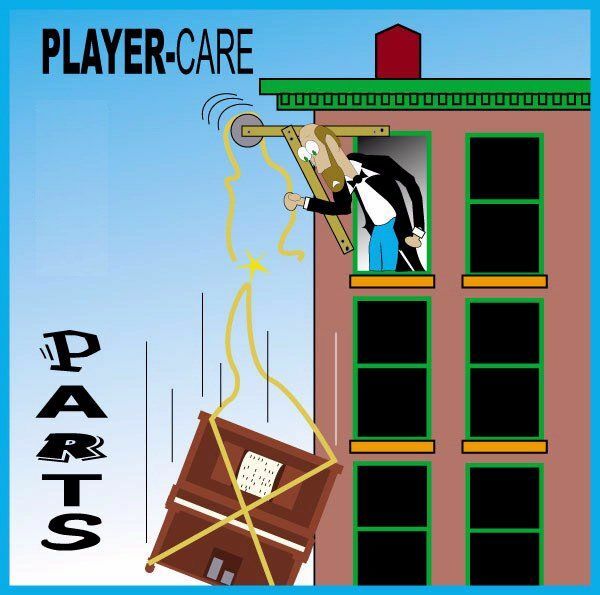 every piece of felt, leather,  all dampers, and hammers in the piano action. 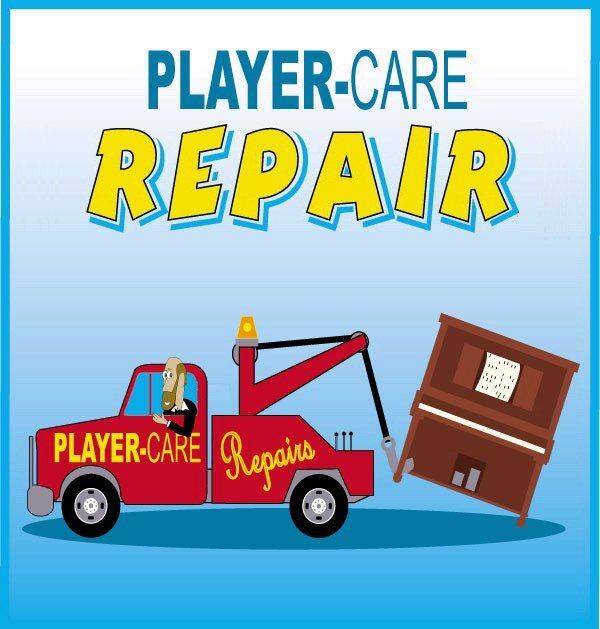 I do not intend to replace the pin block, pins, or re-string the instrument. I have already rebuilt the air motor and timed it. The TUTTLE METHOD works like a champ for working on the striker pneumatics. reassemble the valve blocks so travel will be limited to that amount anyway. the case is out being refinished while I work on the innards. By the way, well done on your stand in support of Craig vis a vis MMD. around the plate) with a pair of pliers and pulled it off.